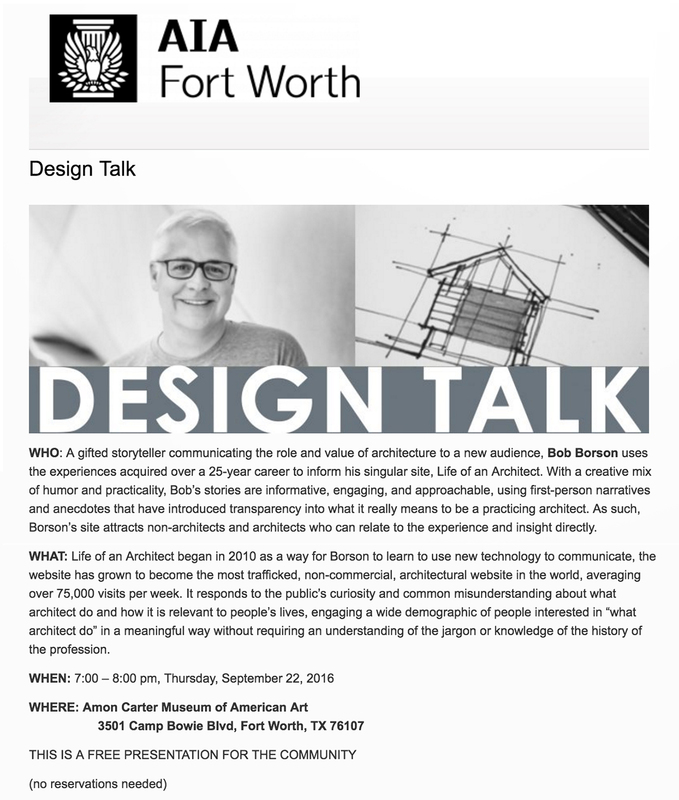 Earlier this year, I agreed to present a lecture for AIA Fort Worth as part of their Design Talk series. What will hopefully make this presentation interesting is that the lecture is open to the general public so the audience will be made up of architects AND non-architects. Who doesn’t like to talk about design? Okay, probably most people but if you are reading this website, you at least have some level of interest in the topic. If you are in the neighborhood this coming Thursday, you should come by and check it out … it’s free, and I can promise you that it’ll be the cost of admission. Here’a description of the my “design talk” with the venue particulars. I will confess that these sorts of presentations are always a bit tricky. If the audience was all architects, it would be easy. If it were all non-architects, also easy. A mixture of both? Oooo – that’s where things can go sideways on you. If I make things too specific to architects, the non-architects could get lost or be disinterested. If I go the other way, there might not be enough meat on the bone to make the lecture worthwhile for the architects. The way I think the best way to deal with this is to hedge my bets and split the middle – enough information that some people can formulate specific follow-up questions, but generic and entertaining enough that someone who is not an architectural insider will think they haven’t wasted their evening. One of the things I do, whenever I stand up in front of a room of people, is to tell them why they should listen to what I have to say. That’s the trick with social media, anybody with a smartphone and an Instagram account can claim expertise. I try and *wow* the audience with the amount of people who actually care what I have to say on the matter of architecture. While working on my presentation this weekend, I determined that I have written 775 articles here on Life of an Architect and those articles have been read over 34.5 million times (according to Goggle Analytics). That sounds like a lot to me, but the thing that I think is far more interesting is that those readers have come from every single patch of dirt on the planet except Western Sahara, the one location Google Analytics doesn’t track. What’s up with that, Western Sahara? Another interesting fact? Those 34.5 Million+ views have visited from 30,990 different cities. The world map above shows the geographic distribution of the Top 20 Countries. I’d say that’s pretty amazing distribution – but I’m not sure that this alone will make the presentation interesting – or long enough. When I was invited to present, I was told that I could talk about whatever I wanted – my interests, projects, etc. Since most people who want to listen to me speak are interested in this blog and the shenanigan’s that take place here, I typically focus my presentation’s in that forum. So the focus of my Design Talk will include a look behind the scenes here at Life of an Architect with accompanying anecdotes … mostly all the things you never consider when you decide to start writing a blog. Like this post – “This Make My Face Hurt.” where I used the above image when describing the window installation on a project I drive by on occasion. The short version, if you don’t want to follow the link and read the entire article, is how every window on this elevation is set at a different height … but just barely. There is also a lot of variation in the brick window sills. Finally, I don’t care for glass block and if you look at the second image from the left, you can see that there is a piece of duct tape set in the middle of what is assuredly a window to a bathroom. How are they going to solve the problem of filling that hole if you can’t buy a 2″x2″ piece of glass block? The hits just keep on coming. I thought the solution – and subsequent meticulous care and skill – of installing a tile in a field of glass block should be pointed out. Not everyone agreed, and someone thought I was losing focus on the real issue at hand – my ability to correctly identify the Saint depicted on the ceramic tile. Of course it is, terribly sorry. I will admit that when I started Life of an Architect 6 1/2 years ago, I had no idea what I was doing or how to actually do it. Without any knowledge that would convince me this was a bad idea, I waded out into the fast moving digital waters and just tried to figure things out as I went. Along the way, I’ve been lucky in that I haven’t made any mistakes (by my count) where I wasn’t able to recover – I can probably count on one hand the number of things I would do differently. The intent of my presentation this Thursday will be to show the good, the bad, AND the crazy that comes with writing a blog. What I’ve shown above is an incredibly small sample of the ground that my AIA Fort Worth Design Talk will cover … a look at the glamorous world of blogging. Should be a good time, I’d love for you to come on out and say hello. Cheers – see you this Thursday.